Many of us have no doubt heard stories from our parents and grandparents of their idyllic kampong lives and the games they played during their joyful childhoods. For most of us today, the games we have come to know are the single player ones on a bright screen. Back in the day, games were creative – wrought out of pure imagination and items lying around – and children, as well as adults alike, invented them to keep themselves entertained. Of the many games that were created to while away balmy afternoons, were the traditional Malay games played by all. Paintings depicting children jumping over rope have been found in Medieval Europe and even as far back as ancient China. 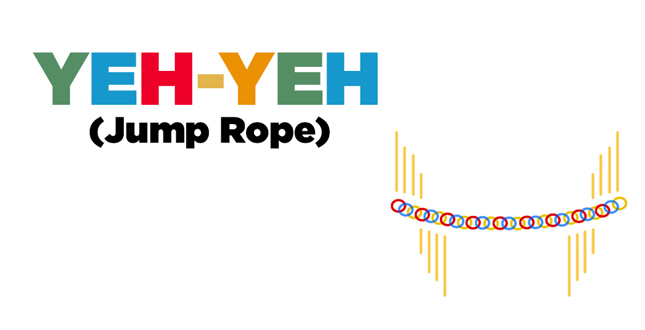 Although the exact origin of when jump rope came about is unknown, jump rope –or yeh-yeh as it is known to the Malay community – is a game that was played in the yesteryears. Recently making a resurgence among children again, the game is simple with straightforward rules. The rope, made up of many rubber bands, is held at opposite ends while a player attempts to jump over the rope in the middle. Hold the opposite ends of an elastic rope made of rubber bands with another player while a third player attempts to jump over the rope. Raise the rope a little higher each time the player successfully jumps over it, up to a point when the player can no longer clear the height of the rope without touching it. The player who clears the highest point is the winner! Players can also come up with their own rules to increase the difficulty of the game. Other methods of playing include standing with two to three other friends in the middle and attempting to clear the rope as it swings above and under them. Today, most of us who still play the game use a plastic PVC (Polyvinyl Chloride) cord or durable cord instead of intertwined rubber bands. Around since antiquity, spinning tops are toys that are designed to spin rapidly on the ground while precisely balanced on its tip. Traditional tops used to be made from wood or a hard fruit, iron and lead, and could be set in motion by winding a string around its axis and quickly pulling it. Today’s tops are made of plastic and don’t require a string to unwind it fast enough to send it spinning: a simple flick of your wrist and your gasing is off. The type of games involving the top are usually ones that test the endurance of the top to keep on spinning – in a sort of ‘spinning contest’ or the ability of the top to strike another top in a ‘striking match’. 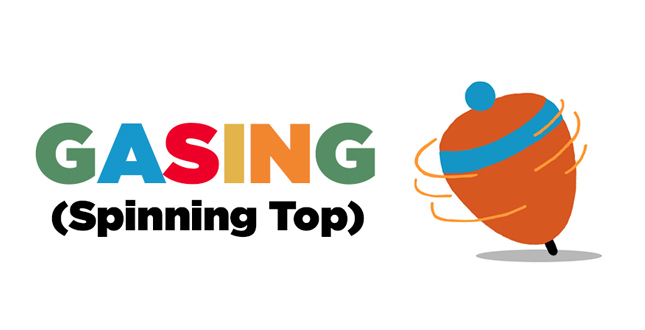 Tie a string tightly around the top of the gasing. Throw the gasing and pull back the string at the same time. The gasing that spins the longest wins! In the spinning contest, the person who can afford to keep his top spinning for the longest amount of time wins the match. The top is usually launched and then carefully transferred onto a wooden panel to spin for as long as it can. Surprisingly, the current record stands at two hours! If you were playing the striking match however, you wouldn’t have to watch a top spin endlessly – instead, you’d be playing to topple your opponent’s top by deliberately striking their top with yours. The aim is to displace it and cause it to lose its speed and balance. The capteh is another game that has been around long before it came to our part of the world. Today, the object used to play this game looks like a flat rubber base that sprouted colourful feathers but when it was first created to play a simple game of keeping it in the air using one’s heel of the foot, it had a primitive feathered appearance. Capteh has been dated to 5th century BC in China, known then as Jianzi or ‘shuttlecock’ to the military service men who used the game to train, and Shaolin monks in Henan, to strengthen their martial art skills. Since then, the game has travelled to many Southeast Asian countries and given different names. Capteh very recently reached the Western world and has debuted as ‘Kikbo’. A capteh is a feathered shuttlecock – start by kicking the capteh into the air with one foot and keep it in the air by kicking it. A point is awarded for every kick. The objective is to keep this going for as long as possible. 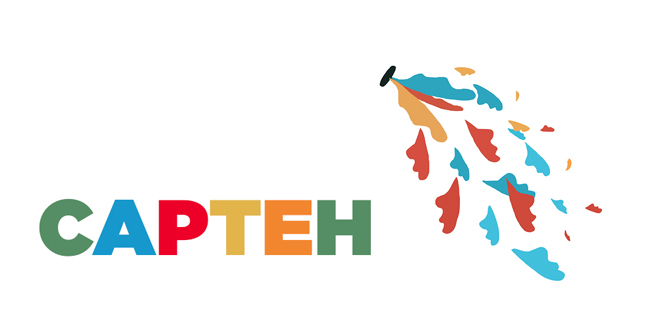 Recently inducted as a competitive sport, capteh can also be played in a small group where players compete against each other or compete as a team. When competing individually, players can agree on a winning tally of continuous kicks, with the first person in the team achieving it considered the winner. A player is allowed to touch his foot down with each kick, but not allowed to touch the capteh with his hands. When playing as a team against other teams, each group stands in a circle. Each team member then takes a turn attempting to keep the capteh in the air until they lose their balance or miss the capteh. The next team member continues the count and this carries on until all the team members have taken a turn in the game. The winning team is determined by the highest number of kicks in total. 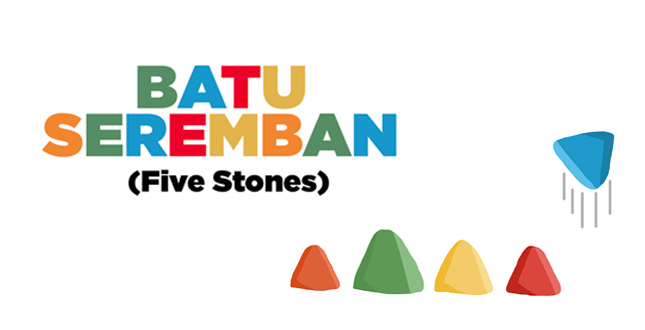 Batu Seremban is a game that is played with five stones. Seremban refers to the West coast of Malaysia where the game was brought to Singapore from, whereas on the East coast of Malaysia, the game is known as Batu Serembat. In the past, players used to substitute today’s pyramid-shaped cloth bags of sand or rice with actual stones or seeds. The game of five stones is believed to have originated in Ancient Asia, during the Siege of Troy in 1184 BC. Played sitting down, the game that involves a complete set of eight steps, has been said to improve eye sight, memory, and concentration. Throw the five stones on the ground and select one stone. Then, toss it in the air. With the same hand, pick up a second stone from the ground and catch the first stone very quickly before it touches the ground. Now with two stones in hand, toss one of the stones into the air and pick up a third stone from the ground. Next, throw one of the three stones in hand into the air, whilst picking up a fourth stone from the ground and attempting to catch the falling stone. Finally, throw the fourth stone into the air and pick up the final stone on the ground. The game of five stones has seen players invent many different variations, each with varying difficulty. Interestingly, this game has also travelled to many different countries and assumed different names such as Jackstones, Chuckstones, Dibs, Dabs, Fivestones, Otadama, Tally and Knucklebones. 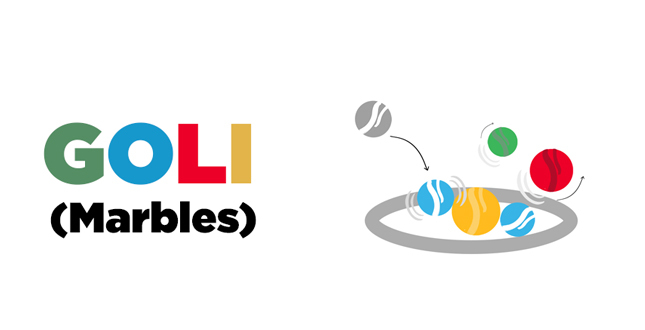 Also known as kelereng or guli, Goli is a game played with marbles. Made of either glass, clay, limestone, or plastic, the marbles are used to hit another players’ marbles in an attempt to claim them. Due to the tactics of the game, an open space that has a flat surface is required. Usually, no more than five players play the game at any one time. Draw a circle on the ground and each player will place a marble in it. Throw the marbles from behind one of the lines. Player whose marble is nearest to the opposite line starts the game. Players then stand behind the opposite line and throw their marbles at the ones in the circle. Player gets to keep the marble that is pushed out of the circle’s boundary. Goli requires skill and accuracy to throw one’s marble to displace the others in the circle. Often, players miss the circle by throwing their own marbles too hard or aiming for packed areas of the circle that is more challenging to dislodge other marbles. The end of the game arrives when there are no more marbles within the circle anymore and one of the players has collected the bulk of the circles’ marbles for himself. 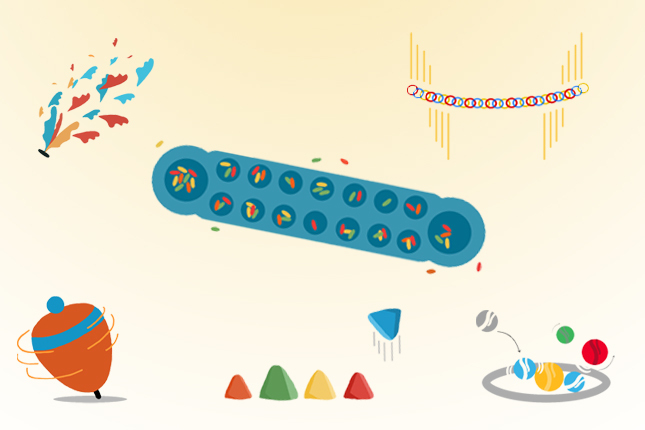 This game is particularly agonising for some players to play because each player brings his or her personal set of marbles to the game – which he or she can potentially end up losing. The word ‘Congkak’ is synonymous with traditional Malay games: often times when Malay games are mentioned, this game is one of the first to be brought up. Congkak can be considered the chess equivalent of Malay games, in the way that it requires players to think moves ahead and strategize. 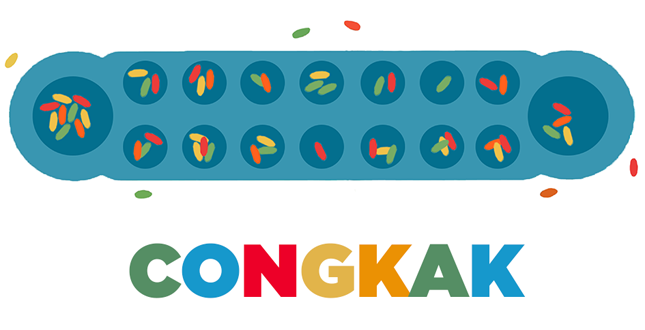 Incidentally, the word ‘congkak’ is also believed to have originated from the old Malay language to mean ‘mental calculation’. The word also refers to the cowrie shells used in the game. A two-player game, Congkak is played in countries like Singapore, Malaysia, Brunei, Thailand, Sumatra, and Borneo, with the game also having counterparts in other cultures and countries such as Sri Lanka (Chonka), the Philippines (Sungka), and Maldives (Naranj). Congkak boards are boat-shaped blocks, generally made of mahogany or teak and they sometimes sport majestic carvings of snakes or birds at either ends. Other than cowrie shells, marbles, saga seeds, or tamarind seeds are used to plug the 7 circular holes. Congkak is played by two players sitting opposite each other with the wooden boat-shaped block in between them. Each player owns the seven circular holes, or ‘houses’ on his left and the large ‘storehouse’ in front. Fill each ‘house’ with seven game pieces, but leave the storehouse empty. Both players will now start simultaneously, scooping up all the game pieces from any of the house on their side. Drop a game piece into the next house and into the houses thereafter in a clockwise direction. Drop a game piece into your own storehouse every time you pass it. This is called ‘sowing’. If the last piece falls into an occupied house, remove all the pieces from that house and sow in the same way (clockwise from that hole) in another round. Your turn ends when the last piece falls into an empty house on the opponent’s side. If the last piece sown falls into your own ‘storehouse’, then you earn another turn, which can begin at any of the seven houses on your side. If the last piece sown falls into an empty house on your side, capture all the pieces in the hole directly across from yours, on the opponent’s side, and place them (plus the last piece sown) in your own ‘storehouse’. If the opposing house is empty, no pieces are captured. If you have no pieces on your side of the board when it is your turn, then you must pass. The game ends when no pieces are left in any of the holes on both sides of the board. Both the players then count the number of game pieces in their own ‘storehouse’. The player who has more, wins. The aim of the game is to get rid of all of your seeds by moving them across over to your enemy’s houses while leaving at least one of your game pieces in all of your own houses.